God saved me through hospitality. To be more precise, God used hospitality crucially in his pursuit of my soul. After years of a debate between my agnosticism and my longing for God—a debate that had taken place in conference halls and libraries and classrooms, in bedrooms and liquor stores and clubs—closing arguments took place in an unexpected location: a Christian family’s home. A pastor and his wife, friends of my parents, invited me into their home to stay. During the mornings, I met with the pastor and aired my grievances with God and Christianity. The Bible passages and commentary he presented to me were vital to what God did in my heart in those weeks. But just as vital was the evidence his wife brought to the debate. Her evidence was often wordless: space made in her afternoon to drink tea with me or take a walk; clean sheets in a bedroom I shared with one of her own daughters; a cultivated calm in a home full of children and teens; a hug given freely with a peck on the cheek. The words were necessary. But the hospitality gave the words context and weight. Crossway (2018). 240 pp. $19.99. With this story of her conversion as a backdrop, Rosaria Butterfield invites us into her home to show us how God can use this same “radical, ordinary hospitality” to bring the gospel to our lost friends and neighbors. When I picked up Rosaria Butterfield’s new book, The Gospel Comes with a House Key: Practicing Radically Ordinary Hospitality in our Post-Christian World, I was transported eight years back in time and transfixed with the realization that Butterfield and I have this in common: hospitality was a crucial means that the Lord used to save each of us. I wonder how many millions of other Christ followers have a similar story to tell? I also wonder: how many of them have then turned around and practiced the kind of hospitality that brought them in? Many readers will remember the story of Butterfield’s conversion-via-supper-table from her first book, The Secret Thoughts of an Unlikely Convert. But this story is only one illustration of many in her latest work. 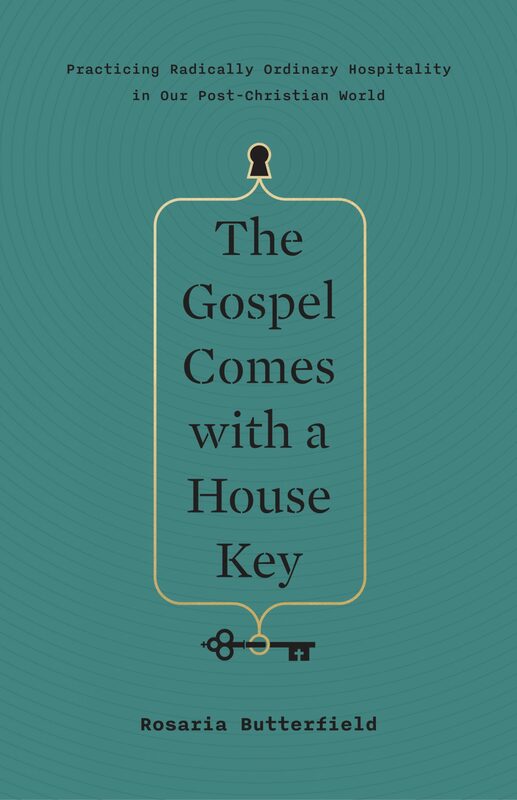 The Gospel Comes with a House Key is both a theology of hospitality and a practical how-to in the form of stories. Many of the stories are of Butterfield’s experiences since her conversion. She and her husband have committed deeply to the daily practice of “radically ordinary hospitality” that she considers compulsory for any person bearing the name of Christ. Christians are to have our doors open, and we’re to be tactical about building relationships in real time with real people in the houses next to ours. Not only is this not optional; to do otherwise actively destroys our witness. Butterfield places the moral responsibility squarely on the comfortable Christian’s shoulders—we might be scared and we might be unsure, but we are fully culpable. Butterfield’s detailed descriptions of her own hospitality let you know that however strong her words, she has the experience to back them up. A hospitable Christian who was converted by means of hospitality, she has earned the right to exhort other Christians. House Key isn’t primarily an indictment; it’s a compassionate invitation. The practical picture Butterfield paints gives you a feeling of “I can do this too” and a sense that it can be done in any space—from a dorm room to a five-bedroom home. It will take planning, intentionality, and dialing back on commitments to create margins of time and money. But it won’t take anything you don’t have in Christ. Butterfield tells the story of adopting teen sons as a way of welcoming the stranger. She tells the story of her family’s relationship with Hank, their neighbor across the street who resisted overtures for a year and was eventually busted for cooking meth right there in the neighborhood—but who was later converted amid continued visits from them in prison. She tells the story of when her atheist mother came to live with them, bringing stress, nastiness, and judgment—and unexpectedly converting on her deathbed years later. These stories sound almost tritely clean-ended, but Butterfield tells them with full disclosure of her own bad attitudes and faithless moments. And taken with some of the messier stories—from Butterfield’s difficult childhood, for instance, or from two recent and painful cases of church discipline in her husband’s church—we remember that we can never truly insulate our lives from the darkness. Instead of hiding, we must engage the darkness with the spiritual weaponry we have in Christ. And sometimes with soup pots and pull-out couches. One of the richest things about Butterfield’s writing is its nuance. She leans hard on the Christian’s tendency to self-protect against ideas and worldviews that offend. But she is also unrelenting in her stance on sin and the sinner. We love people best by introducing them to God as he is, she says, and by allowing his Word to speak into every issue of their lives (and ours). “Engaging in radically ordinary hospitality means we provide the time necessary to build strong relationships with people who think differently than we do, as well as build strong relationships from within the family of God,” she writes in her preface. “It means we know that only hypocrites and cowards let their words be stronger than their relationships, making sneaky raids into culture on social media or behaving like moralizing social prigs in the neighborhood” (13). This isn’t just a pleasant picture of additional ministry we can pick up in our retirement years. It’s a picture of the kind of lifestyle to which every Christian has been called—remembering that without this sacrificial giving of the home, many of us would never have met Christ ourselves.